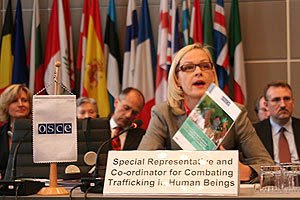 VIENNA, 9 July 2009 - The OSCE Special Representative for Combating Trafficking in Human Beings, Eva Biaudet, launched a new publication on addressing human trafficking for labour exploitation in the agricultural sector in the OSCE region today. "The paper is the first of its kind to address human trafficking for labour exploitation in the agricultural sector throughout the OSCE region. It sheds light on a sector in which workers are commonly exploited, but are often out of sight," said Biaudet. Biaudet presented the publication along with her office's results and priorities to OSCE participating States in a mid-year address to the Permanent Council today. The third Occasional Paper, "A Summary of Challenges on Addressing Human Trafficking for Labour Exploitation in the Agricultural Sector in the OSCE Region", is intended as a policy tool for decision makers and practitioners. It presents an analysis of labour trafficking, including through case studies, in one particular economic sector - agriculture - which according to the International Labour Organization, employs over one billion people around the world. Agriculture is the second largest employment sector globally, with women and young people in particular working in this sector. "This thorough analysis of the challenges in the agricultural sector aims to assist countries to identify the structural issues and deficits of this sector that cause or exacerbate a worker's vulnerability to becoming a victim of trafficking," said Biaudet. Biaudet also discussed the next high-level Alliance conference on "Prevention of Modern Slavery: An Ounce of Prevention is Worth a Pound of Cure", which will take place in Vienna on 14 and 15 September. The conference will present the preliminary results of research on the business model and socioeconomic causes of human trafficking to better prevent the crime. It is great to see the issue of labor trafficking, more specifically farmworker trafficking, gaining greater traction around the world. Government agencies and major international organizations like OSCE and the ILO have taken to putting together better reports and guidelines when dealing with this aspect of trafficking. Positive steps all around. Noce to see this type of informative blog, this is the greatest way to understand the things very easily and clearly too.